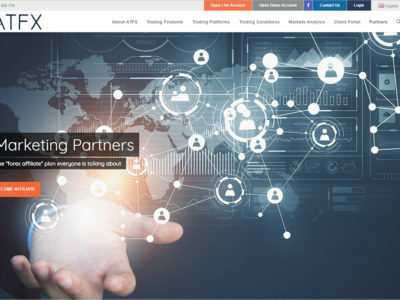 The new affiliate programme launched by ATFX Global Markets (CY) Ltd (ATFX), the Marketing Partners Programme (MPP), is very promising. An in-depth review of the programme structure and how it functions reveals that the biggest advantage it offers partners is that they get to work in a fully compliant and regulated environment, which is often not the case. ATFX is regulated by CySEC, authorized in the EEA and is registered with the UK FCA. Clients from many other non-EEA countries are also accepted as the broker holds many of the required legal opinions to do so. The company takes special care to devise products and services that are fully compliant with existing regulations. In fact, MPP is inline with the newly updated MiFID II regulations, which provide greater protection to the consumer and weed out brokerages that fail to keep the best interests of their clients and partners as a priority. A close look at MPP shows that ATFX is one of the few companies making life easier for its online affiliates. The first thing that stands out about MPP is the way it credits commissions. Most affiliate programmes link commissions to the trading activity of introduced clients, including volumes, spread, instruments, number or size of deposits, number of trades and more. However, regulators have been trying to discourage this to protect investor interests. In addition, numerous brokerages attempt to keep a sizable chunk of the earnings for themselves, by fudging the attribution to credit their own marketing department for client acquisition or changing payment triggers, effectively cheating partners out of their commissions. By using an innovative commission structure, which pays partners based on where an introduced client is within the company’s sales funnel, MPP resolves many problems that so often plague affiliates today. By not linking commissions to deposits and trading activities, ATFX also provides peace of mind that the programme is not only in the best interests of the clients introduced but is also not at risk of being terminated by regulators. When such a programme is shut down, the partners associated with it lose their livelihood overnight, which is not as uncommon as many would like to think. So, MPP gives affiliates an opportunity to work within a compliant and professional environment where the risk of being targeted by regulators is considerably minimised. As mentioned earlier, another common problem is that brokerages find ways to delay or even deny commissions. By linking commissions to where a client is within their sales funnel, ATFX ensures that its partners get paid for every single lead they bring in. When it comes to marketing services, ATFX behaves differently to other brokers. Instead of preventing partners from marketing their services on the same online and offline channels as the company’s own marketing team, ATFX encourages affiliate marketing and mentors those who need it. According to AFTXgm.eu, their primary mission is to help clients and partners succeed – which explains why the team is committed to going the extra mile to provide assistance. ATFX ensures partners always have the help they need – when they need it. The company has made a name for itself when it comes to excellent customer support offering impeccable account management and prompt, multi-lingual support provided by knowledgeable professionals. In addition, the company offers valuable educational resources to the introduced clients, which are very useful especially for beginners in the financial markets. ATFX rigorously trains new clients and provides key updates and information on the financial markets. The company offers attractive spreads and the ever-popular MetaTrader 4 (MT4) trading platform. One of the most appealing aspects of the MPP is that it is a 100% bespoke programme. It offers different account plans which partners can choose from based on their expertise and experience levels. These plans are carefully tailored to meet the needs of each partner. Weekly commissions are based on up to 700 CPA equivalent with professionally calculated KPIs and performance benchmarking. MPP is a step ahead of existing partner programmes. And while the commission payments may be equivalent to other programmes, the difference is that introducers get paid for leads, while being assured that they are in a programme that has the best interests of affiliates at heart. The peace of mind gained from working within a fully compliant and regulated system cannot be over emphasised. ATFX stated that MPP’s launch in Europe and the UK was only the beginning. The company launched its services in South East Asia in 2017 and is in the process of launching its Middle Eastern office. ATFX expects to be able to replicate its European success in Asia and the Middle East, where it is already in the process of seeking the required regional licenses. The company intends to continue to be a fully regulated and compliant entity so that regulatory risk is never an issue for both its retail and professional clients. Discover more about the revolutionary new MPP from ATFX.